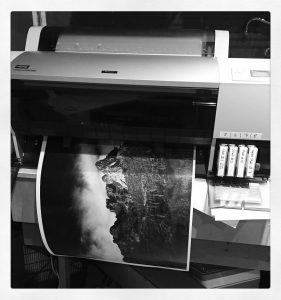 Departing from our traditional (wet) process prints, we now offer inkjet printing through an all-carbon process called Piezography, which strives to mimic platinum palladium or silver gelatin prints, depending on the desired effect. This groundbreaking process uses seven shades of grey and black ink to render the best possible greyscale images that can be printed with a modern printer. Compared to a standard inkjet printer, which uses two shades of grey and black, Piezography prints are significantly more detailed in the extreme highlights and shadows, and display astounding depth. Archivability is always a concern for inkjet process prints. However, because Piezography uses pure carbon instead of pigment, print lifetime is limited only by the durability of the paper, and should be able to last generations without observable fading. Ready to get started? Get in touch and we can start working on your very own Piezography prints.